In a grainy family video, Missy Franklin’s dad tapes his toddler ̶ decked out in short, pink overalls and a denim-blue bonnet ̶ as she tosses leaves and sticks into a gurgling stream. Mesmerized by the water, Missy keeps her mother on high alert ̶ she follows the little tot like a shadow, taking her eyes off of her only once to flash a worried glance at her husband. Finally, Mom hooks her fingers through the back of Missy’s overalls, easing her own tension, and preventing an unwanted nosedive by her daughter. Her mom’s mission was accomplished. Franklin, who became a four-time Gold medalist by age 17, loved the water from the start. “I mean, bath time was my favorite time as a baby. If you just got me wet, I was the happiest little kid ever,” says Franklin, now 20, as she shared her childhood story amid the clanking cups and humming espresso machines of a Starbucks in Centennial, one of her regular neighborhood haunts. Her mother put Franklin in parent/infant swimming lessons at 6 months old with the intent of keeping her safe. Today, Franklin has joined the USA Swimming Foundation as an ambassador to boost its mission, one that mirrors that of her mother’s. Roadblocks exist for many parents: the cost of lessons; a fear of water. “If a parent doesn’t know how to swim, there’s only a 13-percent chance their child will learn to swim,” Hesse says. In response, nationally publicized messages from Franklin, some with her mother, will begin airing soon about the importance of child water safety and the USA Swimming Foundation’s Make a Splash initiative. 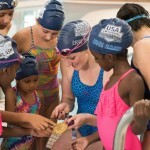 The initiative provides grants to swimming programs across the country, including in Colorado, that agree to offer free or reduced lessons and/or water-safety classes (see www.usaswimmingfoundation.org for local partners). “Missy was darling. She was always happy, and she listened, and she was able to catch on immediately with just about anything I gave her to do in our lessons. She never got tired. She never got bored. She just loved it. I remember telling D.A. (mom) at one point that Missy was going to be really good, very good. And she said: How do you know? She’s just a little girl! 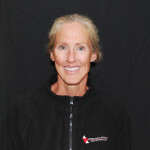 I’ve never come across anyone like Missy, and I first started coaching when I was 18.